I love the flavour of passionfruit with its contrasting sweet and sour flavour. It is one of the significant flavours that to me, represent Queensland. 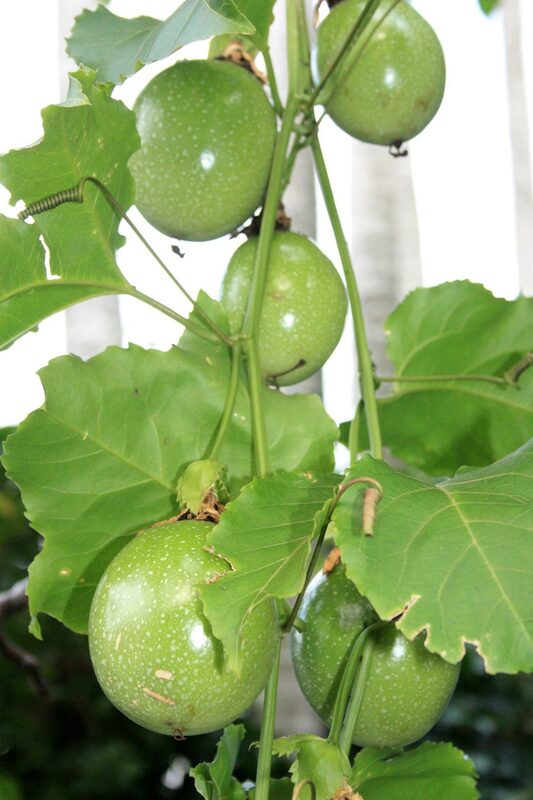 The passionfruit vine is also a fast growing dense plant that is easy to grow so when our neighbour replaced his roof and I felt I was being blasted by the reflection of the morning sunshine I grew a passionfruit vine to block out the sun. Little realising that I would also be feeding the entire possum population of my suburb. Our uninvited guest creeps along the electricity cable, jumps onto our veranda railing, and indulges in a passionfruit leaf salad with the fruit for dessert. 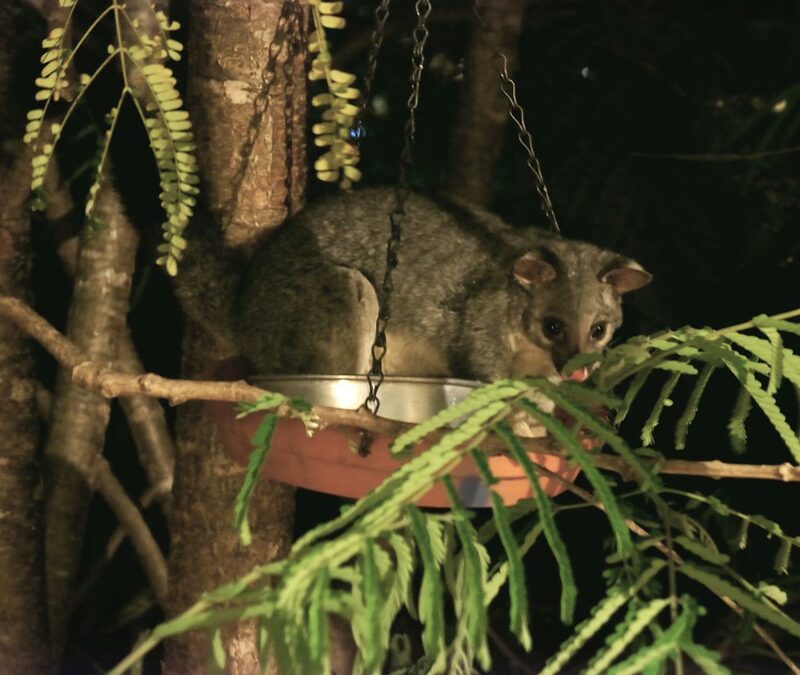 Then satiated by its degustation meal a now corpulent possum will creep along the railing and jump into the bird feeder for an after dinner snooze. I may as well place a sandwich board out the front of my house offering a meal to all those who need one. If there are any left overs the cockatoos enjoy a passionfruit slurpy. Fortunately the vine is bearing prolifically and has twined its way along two sides of my veranda. 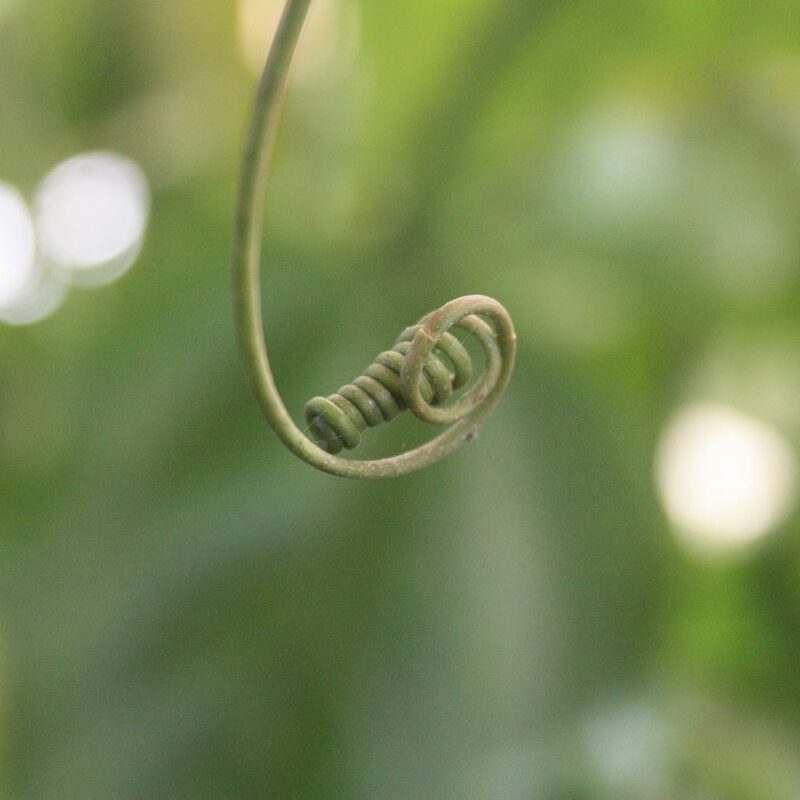 I admire its tenacity and how its tendrils curl around anything that they touch. and even my night time marauders can’t eat all the fruit so I have been exploring how many ways I can use passionfruit in my recipes. We have had passionfruit sauces with duck and chicken, with pancakes for breakfast and brulées for dessert. I have made passionfruit ice creams and sorbets which are just so good and iced cupcakes and biscuits in passionfruit icing. 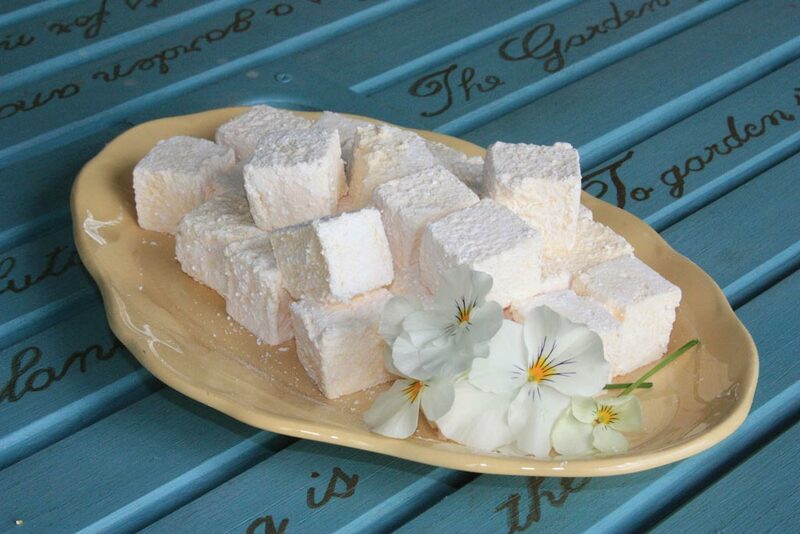 Now I have made the most delicious passionfruit marshmallows. 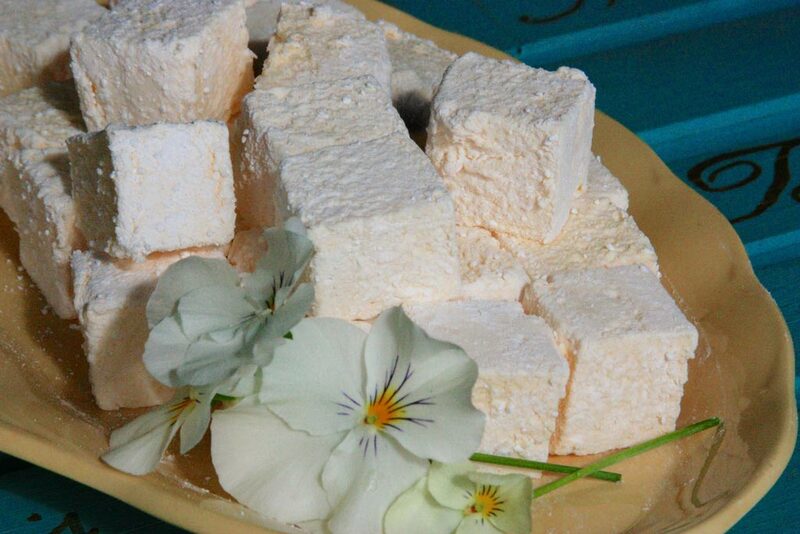 I took some of these marshmallows into an organisation where I was doing volunteer work and a Danish woman said she considered the taste was the quintessential flavour of Queensland, whilst another fellow said it was like being in heaven and eating a passionfruit cloud. They are also very easy to make and quite addictive and you have to be very strong with yourself to limit how many you eat. I watched my father and son eat 6 pieces between them while they were preparing lunch. They are a lovely light lemony colour and I served them on a pretty yellow saucer from the Laburnum Petal range. You can find it for sale at my other site, Maddie and Marie. Prepare a lamington tin by lining it with baking paper. Very lightly grease the paper with vegetable oil then sprinkle the surface with a spoonful of a mixture made up of equal amounts of pure icing sugar and cornflour. I use 25 g of icing sugar and 25g of cornflour. This is very important to do because it stops the marshmallow from sticking and when you cut it up each piece will stay separate. Cut the passionfruit in half, scoop the pulp out and blend briefly so that the seeds separate from the pulp. Remove the seeds by pouring the pulp through a sieve. Discard the seeds. Make sure the pulp is at room temperature then sprinkle the gelatine over the pulp and allow it to soak and form a sponge. This doesn’t take very long. While the sponge is forming, combine the sugar and water in a saucepan. Place on a low heat and stir until the sugar is dissolved. Increase the heat, bring to the boil then reduce the heat until it is just simmering and cook until it reaches 125°C and cook for 10 minutes. The best way to test this is with a sugar thermometer. This is also called the soft ball stage. The entire cooking process will take about 15-20 minutes. Remove from the heat and pour in the passionfruit pulp. Stir the mixture to dissolve the gelatine. In an electric mixer, beat the whites with a pinch of salt until frothy. Slowly add the passionfruit mixture and beat on a medium speed until the mixture is double in volume and has cooled down. It should be very light and frothy. Pour the mixture into the prepared lamington tin and spread it with an oiled spatula. Dust the surface with the sugar and cornflour mixture. Allow it to set at room temperature. The marshmallow can be cut after 3 hours. Its flavor intensifies as it ages. Sprinkle the cut pieces with the icing sugar and cornflour mixture. Then sit back and enjoy the faces of people who eat your ambrosial marshmallow. They will think they are in paradise. This entry was posted in Confectionary, Food and tagged cockatoos, confectionary, marshmallow, passionfruit, passionfruit marshmallow, possums on June 22, 2015 by lorikeetlady.